Gold is chiefly under the influence of the news coming from the French Election and North Korea. 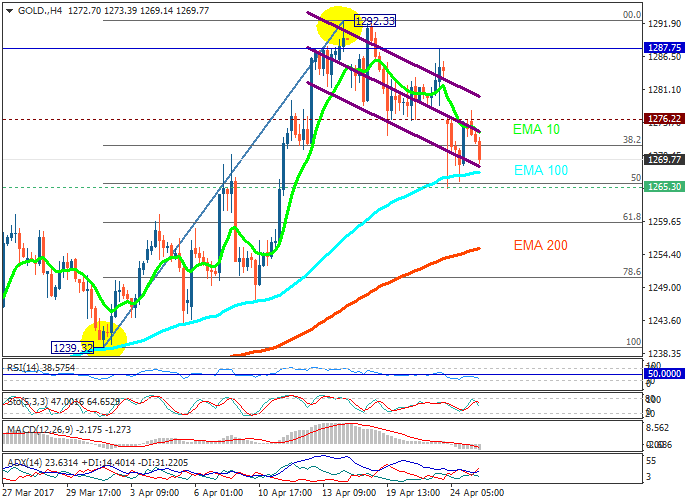 The support rests at 1265.30 with resistance at 1276.22 which both lines are below the weekly pivot point at 1287.75. The EMA of 10 is moving with bearish bias along the descendant channel but it is above the EMA of 200 and the EMA of 100. The RSI is falling towards the oversold area, the Stochastic is showing downward momentum and the MACD indicator is in negative territory. The ADX is showing sell signals. Short positions are recommended targeting 61.8 level of Fibonacci around 1260.